Phoenix is the most populous state capital in the United States and the fifth largest city in the country. Also known as the Valley of the Sun, Greater Phoenix boasts more than 4 million inhabitants. Mesa, Phoenix, and Tempe are connected by the Valley Metro Light Rail. which forms an L-shape and runs through the downtown areas of Phoenix, Tempe, and Mesa. In 2017, Phoenix-Scottsdale-Mesa ranked number 16 on the Forbes list of fastest growing cities in the United States. As the population is growing, so is the food scene. In Phoenix, you can check out charming Bosnian and Khmer restaurants, while Malaysian and Taiwanese street food cafes are hidden in unassuming strip malls in Mesa and Tempe. While Asian restaurants dominate the strip malls, there’s also a plethora of Latin American and Ethiopian cuisine throughout the valley. Here is a list of five lesser-known cuisines you can find in Greater Phoenix. Old Town Sarajevo is located in a small, unassuming strip mall less than ten miles from the center of Phoenix. Step inside and you’ll be transplanted back to village life in 19th-century Sarajevo. With wooden doors and vintage teapots tucked away in the walls, the interior is designed to look like Sarajevo, the Bosnian capital. Snacks from the Balkans are on sale at the counter as well. Bosnia’s cuisine reflects the fact that it’s located at the crossroads of east and west. Geographically, Bosnia and Herzegovina are an equal distance from Turkey and Western Europe. They have their own version of baklava, halva, as well as tiramisu. Staples include cevapi, which are beef sausages served with diced onions, kajmak, and ajvar. Kajmak is dairy-based, while ajvar is made from roasted red bell peppers, garlic, and eggplant. Begova Čorba is a thick, chicken and vegetable based soup, typically served as an appetizer. Sandwiched between Vietnam and Thailand, Cambodia’s food is not well known internationally. While most small cities in Canada and the United States have at least one Vietnamese and one Thai restaurant, Cambodian food is difficult to find in food meccas like New York City and Washington, D.C. Does that mean it’s not as good? Not at all! Amok is Cambodia’s national dish an ideal one to start with. It’s made with fresh coconut milk, turmeric root, garlic, shallots, galangal, as well as kroeung, which is a Khmer curry paste made from lemongrass, and ginger. Unlike a lot of Thai curries, amok (and Cambodian food in general) is not spicy. At Reathrey Sekong, it is served in a banana leaf. The fish is usually catfish or tilapia. Although fish amok is the most common version, some restaurants offer it with meat as well. For the more adventurous eaters, there’s Lap Khmer, which is a raw beef salad (think ceviche with meat), with the beef marinated in lime juice. At Reathrey Sekong, the beef is grilled and cut into cubes. Green mango salads are popular in Khmer cuisine as well. Theirs is served with grilled fish (either catfish or tilapia). Malaysian food is a curious mix of Chinese, Indian and ethnic Malay. 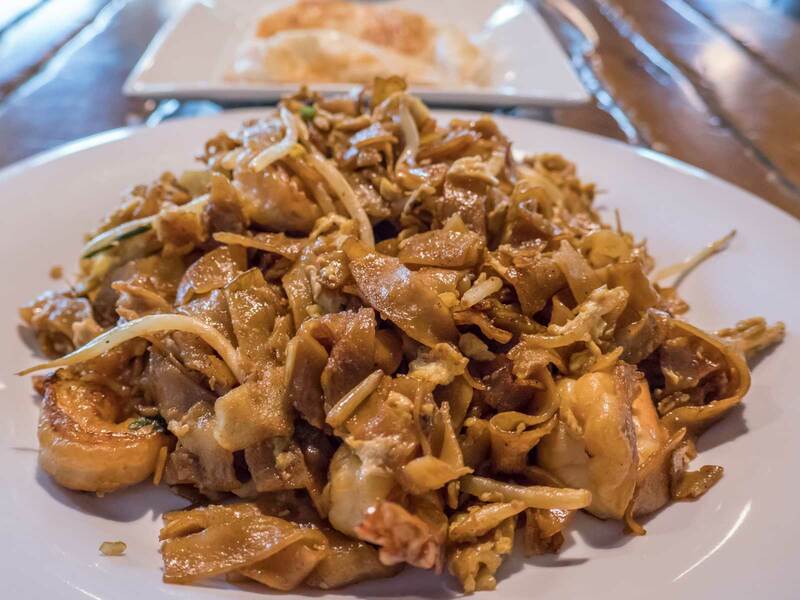 Two of Malaysia’s most famous noodle dishes are mee goreng and char kway teow, both of which can be found at night markets throughout Kulala Lumpur and Penang, as well as the rest of Malaysia. At BP Street Cafe they combine the two dishes, so you get both the egg noodles from mee goreng as well as the flat noodles from char kway teow. Of course, you can also order each dish in its traditional form. The owners are from Batu Pahat, just north of Singapore. Pictures of Malaysia line the walls at this no-frills cafe located in an unassuming shopping center just one block south of the light rail line along Apache Blvd. Roti canai reflects Malaysia’s Indian culture and is a popular appetizer featuring fried bread served with a mild chicken curry. Unless you just don’t like bread or curry, you mustn’t leave BP Street Cafe without trying one of their famous noodles dishes as well a roti canai. Peruvian cuisine is influenced by cultures a variegated as China, Italy, Japan, Spain, West Africa, and the Incas. For example, Peruvian dishes are heavy on rice, which reflects the cuisines of Spain and East Asia. You can also find some pasta dishes. Inca staples like corn, quinoa, yuca date back to the days of the Inca empire. The menu at El Chullo has all the hits and is, therefore, a good place for novices as well and the growing number of foodies that consider Peruvian food to be the finest in the Americas. 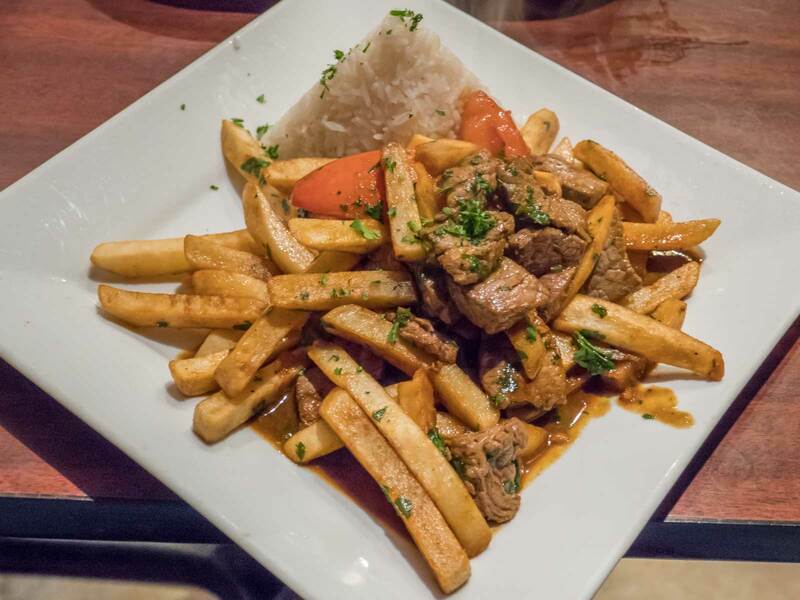 Lomo Saltado is a stir-fry with marinated steak strips, french fries, onions, and tomato. If Peru has a national dish (and according to Google, it does), it’s ceviche. The Japanese aren’t the only ones who eat uncooked fish and leaving a Peruvian restaurant without trying ceviche is like going to an Argentine steakhouse and not eating meat. In a ceviche, the type of fish varies, but it’s usually a white fish, which is marinated in lime juice to kill the bacteria. The result is an overload of citrus, which really does taste great and is less filling. Ceviche is typically an appetizer, but portions at Peruvian restaurants tend to be large. For example, a ceviche is typically served with corn and sweet potato. It goes well with rice as well. El Chullo offers one of Peru’s most common street foods, which is anticuchos: beef hearts on a stick. If you’re feeling less adventurous but want to try something more uniquely Peruvian, try the helado de lucuma, which is lucuma flavored ice cream. The lucuma looks like a mango but has a custard-like texture similar to durian and a sweet taste similar to maple syrup. While Peruvian food is not the most vegetarian-friendly, the menu at El Chullo has six vegetarian items. The people of Taiwan speak the same language as many of the mainland Chinese, but there are some dishes that are more associated with Taiwan than the mainland. Salt and pepper chicken is a popular street food throughout Taiwan as are beef noodle soup, meatball soup, and steamed sticky rice with pork. Those are just a few of the more than 150 dishes on offer at Taiwan Food Express, which is located inside the Mekong Plaza in Mesa. Although bubble tea can be found at many different types of Asian cafes and restaurants, it was invented in Taiwan. Taiwan Food Express has eight different bubble options as well as more than 30 fruit-flavored slushes, to which you can add steamed tapioca balls. Baobing (刨冰) has a much longer and more complex history dating back to the seventh century AD. It’s referred to by many as Taiwanese shaved ice. The base is shaved ice, but you can add as many toppings as you like and turn it into your own edible art project. Options typically include bean, jelly, mochi, boba, condensed milk, rice balls and fresh fruit, all of which are available at Taiwan Food Express. Inside, there are dozens of pictures illustrating the more popular items on the menu. The cafe is located just south of the Main-Dobson intersection, and therefore easily accessible from Phoenix or Tempe by light rail. Compare hotel prices, read reviews and book your Phoenix hotel at TripAdvisor! This post was sponsored by Visit Phoenix. Looking at the pictures makes me drooool!Lol . Seems like Phoenix is underrated as a foodie destination. I’d love to have a food trip here someday! This is pretty awesome! I didn’t expect to see Taiwanese or Malaysian food there in Arizona! And they look pretty authentic too!! Yum! hope you enjoy them! I like how the food culture is evolving worldwide! There are so many cuisines to try. You’ve done a great roundup of the Arizona eats. I have never been to Arizona. However now after seeing these plates I’m excited to eat good when I visit. Wow that all looks amazing! I love what a variety there is! That soup looks delicious, you can’t beat a hearty broth like that! OMG they look so good! Great idea to post about cuisines like these as they don’t gain that much acknowledgement. You basically put helped put them on the map! It is interesting to read about these cuisines. I have a Peruvian restaurant near my place but have never been able to try it because of lack of vegetarian dishes. I love Malaysian food especially Beef rendang, Laksa curry and Roti canai. Cambodian food is the one on the list that I have not had an opportunity to try but love that it always looks so fresh and tasty. Hopefully one will open in my city some time. 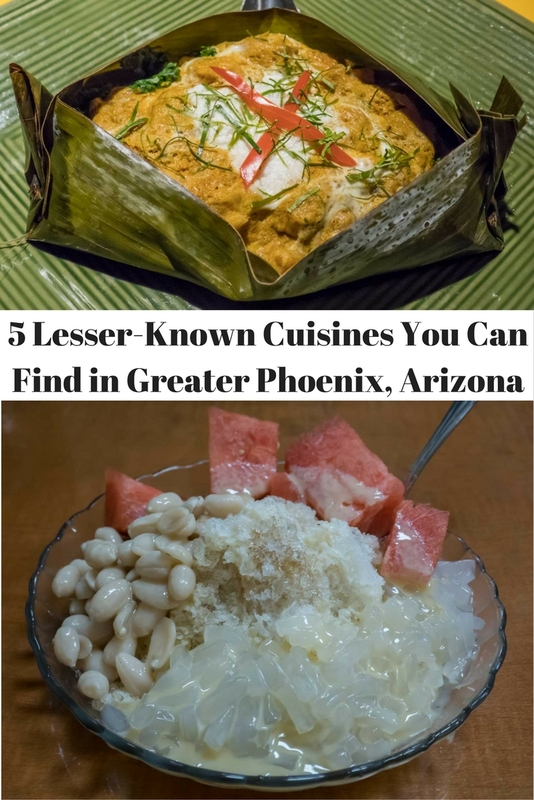 I honestly never knew that the cuisine was so diverse in Phoenix – this is awesome! I will bookmark for the day that I plan a weekend there. The Valley under the Sun? mmmh…not only is enticing but even the food cuisines!Jeez!Your pictures are so fantastic, making the food look too fresh and yummy! Such a great roundup you have for us but definitely the Peruvian: El Chullo will do it for me. I’m a die hard of french fries so those ones I’d eat to my fullest. As a foodie, I totally appreciate these suggestions and I will note them for when I visit Phoenix! One of the things that I love most about traveling is being able to taste the food and it’s awesome to know that you can find different cuisines while you’re in Phoenix! I’d love to check these restaurants out! I love food but I have never eaten from any of these cuisines. Mouth watering pictures! I will have to try them someday, hopefully in the country it originates from.